I was thrilled to be invited to the Chapin School Book Fair last year– excited to see my Lilac Girls heroine Caroline Ferriday’s alma mater. Back then I was about three quarters of the way done with the prequel to Lilac Girls, Lost Roses and mentioned it to Eleanor Southworth, former Chapin archive coordinator, since the prequel features Caroline as a child and young woman. 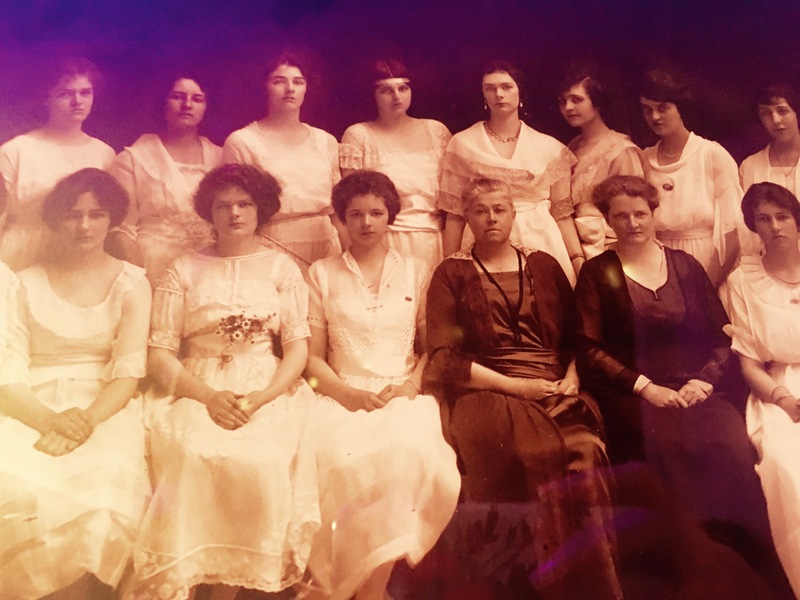 “Oh, I think class of 1920 is hanging on the wall in the other room,” she said. I was thrilled when Eleanor came back bearing a framed photo, above. Can you find Caroline? The lovely earrings and necklace she wears here may be the same ones she bequeathed to her dear Polish friends in her will. Little did her Chapin teachers know their student would go on to do such great things. Thanks for sharing this fascinating picture. Caroline was easy to spot. She was elegant even as a young lady. Having just finished Lilac Girls at the recommendation of my daughter I am excitedly awaiting Lost Roses. We both enjoy first person narrative and I particularly liked how you were able to break up the harrowing narrative with a softer, even romantic, one. Caroline certainly stands out amongst the crowd, a foreshadowing of her future. I enjoy how you continue to research your project! Your commitment to this story is to be commended. I was not able to get to Connecticut this May but I hope it will become an annual event so as people begin to read your story the group gets larger. I just this past week informed another friend of “Lilac Girls” and know she will love it as I did! Thanks for being my best PR, Barbara! I have really enjoyed reading about the inspiration for your novel and also all your research. A labour of love. I will enjoy reading the book. Hope you enjoy it, Dee! It takes me so long to read a book such as yours as one thing leads to another in my reading. I actually started the book because of my interest in France during the wars and also, because I’m second generation Pole. Now I’m intrigued with Carolina and your research. What a remarkable, unsung hero who needs much more uncovering to the world. Thank you. I so agree about Caroline, Lori. She really was remarkable. Martha. Hopefully, I will have an opportunity to meet you at an event in Ct.
Friends and I visited the Bellamy-Ferriday House in June and thought the experience was well worth the visit. I’m fascinated with the history associated with your work. Look forward to the prequels. Thank you for writing this book. I am an avid reader and have never felt compelled to write to an author. 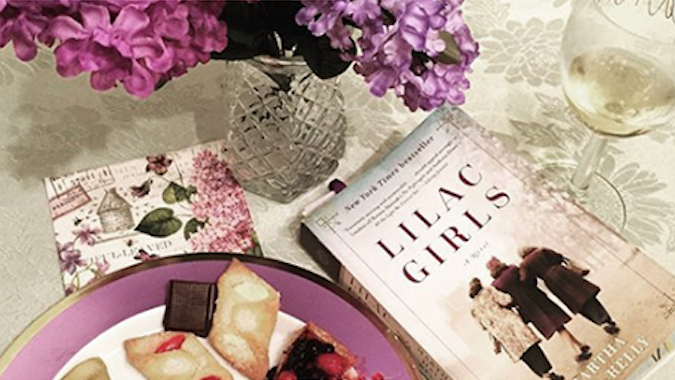 However after reading Lilac Girls I had to write and ask you to keep writing. I couldn’t put it down. It was by far the best, moving, well written book I have ever read. Can’t wait to read more of your novels. I’m from Connecticut and on one of my trips home I will visit Caroline’s Home. Just finished your book. You brought to life and humanized this very dark chapter…and I really loved how you threaded the ladies together . Your authors notes helped me understand your process. When did you know you’d turn it into a book? After your visit to Ferriday’s home? Or was it a more gradual pull towards a book? Hi Marti, It was several years into the research that I finally thought to write a novel…then it was five more years of writing. Loved every minute of it! I’ve discovered late in my life that I read too fast the first time around a book. On the second reading, I really get things. I’ve read a lot of historical fiction. None can compare to this one with the mix of truth. What people don’t get abut the Nazi’s is that they were cruel. Starting at the very top. Everything done was to strike terror on the hearts of everyone. People did what they did because it was expected of them. I was particularly moved by the later part when the camp guards were sent orders on who to kill next. And how the women started to wail about it. That was just plain human cruelty. At my first reading, I felt sorry for Dr. Oberheiser and what she did. Another “I was just following orders”> by another Nazi killer. But when I read the book a second time and saw how Herta took the ring from Kasia’s mother, the circle was completed. Dr. Oberheiser was as much of a remorseless killer as Himmler or any Nazi. To anyone who really enjoyed the book, read it again. There are things that happened that you miss and don’t understand it unless you go around again. Now I have to go and re-read Anthony Door’s “All The Light We Cannot See”. I love this, Christopher. It’s so true that reading a book a second time can give whole new insights. And agree about Herta, too. She may have had some remorse later in life when her medical license was gone but it’s hard to say for sure.